A Durango & Silverton Narrow Gauge Railroad crew clears snow from the tracks this week at a snowslide area south of Silverton. Eight to 10 avalanche slide paths have the potential of covering the tracks between Cascade Canyon and Silverton. 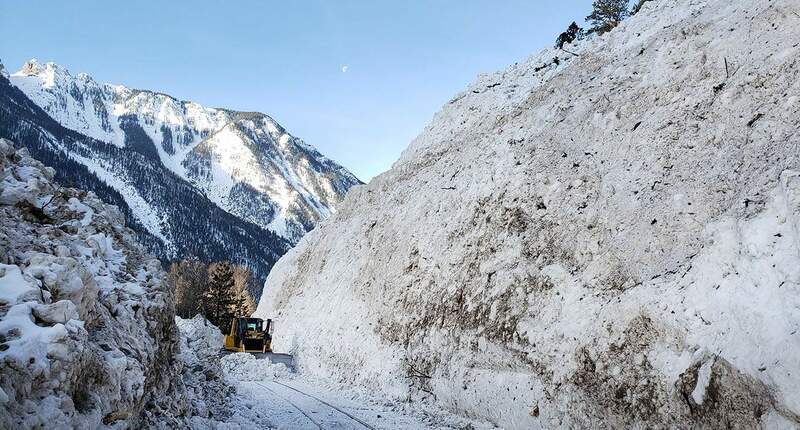 Slowly but surely, the Durango & Silverton Narrow Gauge Railroad is digging out of the onslaught of snow and avalanches to clear the tracks for the first ride to Silverton in May. Jeff Johnson, general manager of the D&SNG, said clearing the tracks of snow is a laborious task the railroad’s crews tackle every spring. But this year, consistent, heavy snow in the high country has made it all the more daunting. The D&SNG’s route from Durango to Silverton doesn’t encounter true avalanche danger until it reaches Cascade Canyon, about 26 miles north of the train station in Durango. From there, north to Silverton, about eight to 10 avalanche paths have the potential of reaching the railroad tracks. As a result, the D&SNG surveys every year from a helicopter to see if avalanches should be triggered with dynamite to avoid potential future risk. 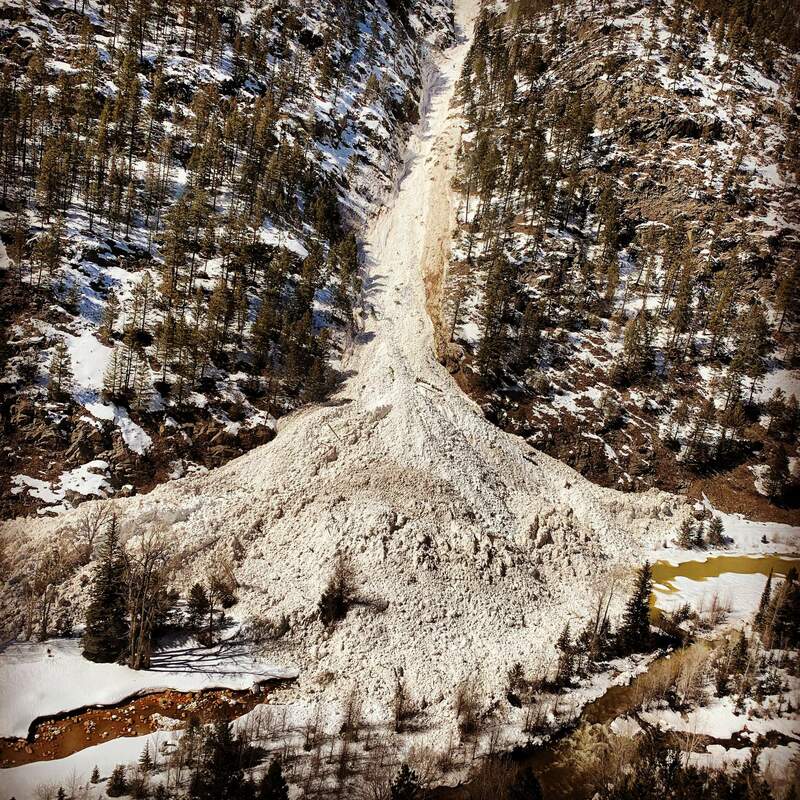 Photographs and video recently went viral after the D&SNG crews triggered one avalanche that covered the Animas River. The train is scheduled to begin full service on May 4 from Durango to Silverton. 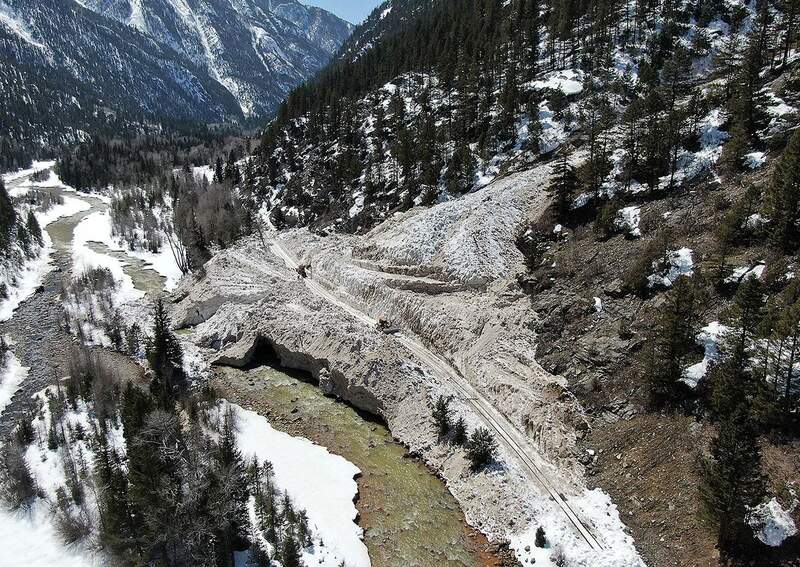 The Durango & Silverton Narrow Gauge Railroad triggered this avalanche path, which crossed the Animas River near Needleton, to reduce future slide risk. The train has battled the elements to make it to Silverton since the line was completed in 1882. Jim Donovan, San Juan County’s director for the Office of Emergency Management, said that particular avalanche was near Needleton and put 60 feet of debris on the tracks. He said there is not a concern at this time the avalanche would cause a dam of the Animas River. Donovan, who is also director of the Silverton Avalanche School, said D&SNG crews are regularly trained how to work in avalanche areas when clearing snow off the tracks. He said the risk of avalanches is something the D&SNG should continue to be concerned about, especially in late spring. Indeed, the D&SNG has a long history battling the elements to make the trip from Durango to Silverton since the line was completed in 1882. Denver and Rio Grande Railroad locomotive No. 327 emerges from the south portal of the Snowslide Tunnel in San Juan County at mile post 492½ on the Silverton branch. Jonathan Thompson, a local journalist and author of “River of Lost Souls: The Science, Politics, and Greed behind the Gold King Mine Disaster,” chronicled many of these feats in an article he wrote for the Silverton Mountain Journal. Silverton, for example, was without the train, its main lifeline for food and supplies, for 73 days in 1884. Thompson said the stranded people of Silverton resorted to killing and eating milk cows as food ran short. A Durango & Silverton Narrow Gauge Railroad crew clears snow Monday at the snowslide area south of Silverton. 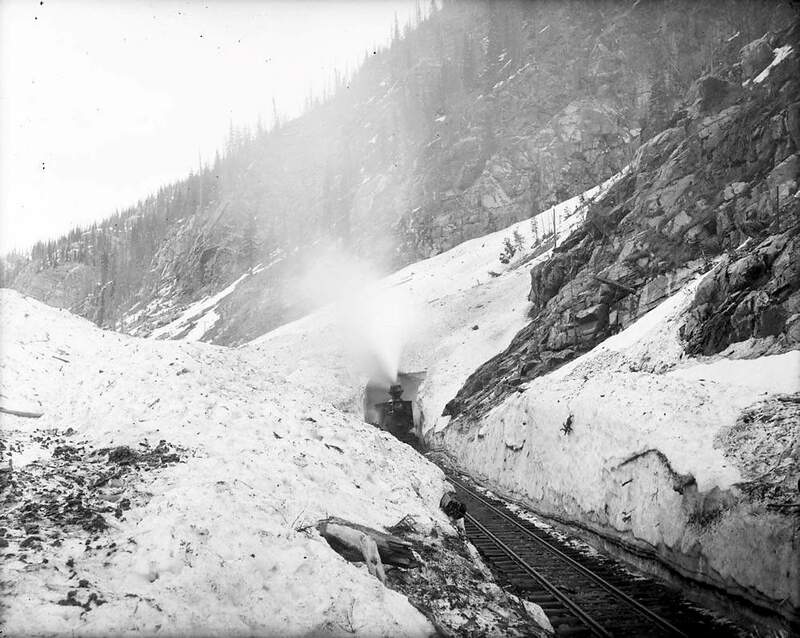 In March 1906, avalanches had buried the train tracks in 50-foot piles of snow from at least 15 slides, Thompson said. It took a team of 200 men 33 days to clear a path from Needleton to Elk Park. A particularly stormy winter in 1931-32 closed both the roads and the railroad from February to the end of April. Thompson said one D&SNG train crashed near Rockwood trying to make it to Silverton. D&SNG’s Johnson said the railroad ran up to Silverton year-round from 1882 until 1951, when highways became an easier way to reach the high mountain town. Back in the old days, it was a constant battle with the elements, he said. Crews would even dig out tunnels so the train could pass through. But these days, clearing the tracks has become a little more sophisticated. A team of two dozers and one excavator typically work on a daily basis to move snow. 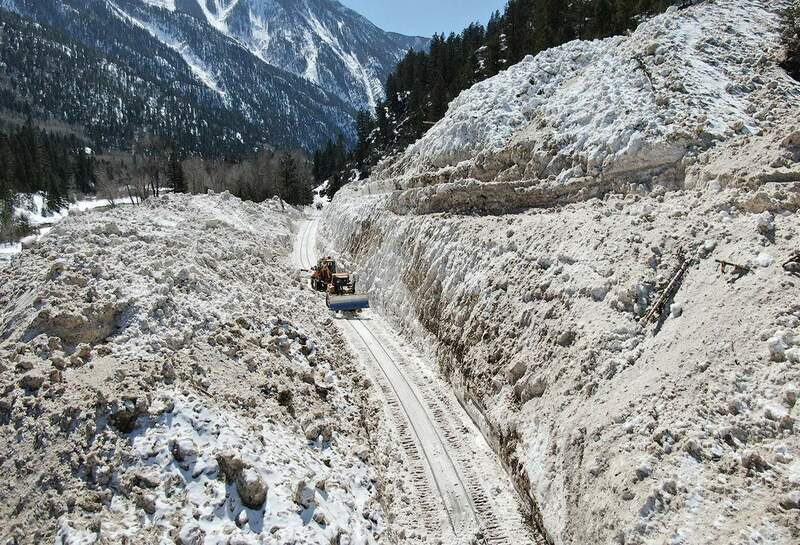 A Durango & Silverton Narrow Gauge Railroad crew clears snow Monday at a snowslide area south of Silverton. Every year is different, Johnson said. Last year, which saw little snow, trains were mostly able to make the trek up without any removal work. This year, however, crews started about three weeks ago. Johnson said it could take up to six weeks to dig out the tracks. And it’s not uncommon the tracks themselves have been damaged and have to be repaired. Johnson expects that to be the case this year, especially with snowpack at nearly 160 percent of historic normal averages. Durango & Silverton Narrow Gauge Railroad clears avalanches The Durango & Silverton Narrow Gauge Railroad clears avalanche snow from the tracks between Rockwood and Silverton in 2005.